This year is the 25th anniversary of the release of the original Jurassic Park film and the start of a massive franchise. Four films, with a fifth film releasing later this month and a sixth film already planned, multiple comic books, toys and of course video games. The first Jurassic Park game came out in June 1993, the same month the first film hit theaters. Since then over 20 different video games for a variety of platforms have been released. Let’s take a look back at some of the best, worst and weirdest Jurassic Park video games. A game where you build and operate a theme park seems like a perfect match for the Jurassic Park franchise, and Operation Genesis proved this was indeed a fantastic combination. Inspired by popular games like Roller Coaster Tycoon and Zoo Tycoon, Jurassic Park: Operation Genesis didn’t set out to reinvent the genre, but instead add dinosaurs into it. Dinosaurs that can break out and kill park guests. Jurassic Park: Operation Genesis is still a fan favorite game. Fans are still modding it 15 years later. In fact, you can download a mod that turns the game into a Jurassic World game, complete with new textures, dinos, and UI. Could a T-Rex beat a Triceratops? Or could an Ankylosaurus defeat a Velociraptor? After seeing Jurassic Park, these were the types of questions fans around the world were asking each other. Warpath: Jurassic Park was the perfect game to settle these debates. Warpath is a fighting game with dinosaurs. It’s a simple concept that resulted in a less-than-great fighting game, but it’s still a super fun Jurassic Park game. Like Jurassic Park III, it wasn’t great but it still had dinosaurs in it. Warpath was released two years before Jurassic Park III, which is where the Spinosaurus was first introduced into the films. But Spinosaurus actually appears in Warpath, though much smaller than her film counterpart. The most recent Jurassic Park game released is also one of the best. Evolution builds on the Operation Genesis concept of building a park and updates the visuals and gameplay. These are easily some of the best looking dinosaurs in a video game, and their animations are wonderful. LIke Operation Genesis, you build a park, clone dinosaurs, and (try) to keep guests safe. 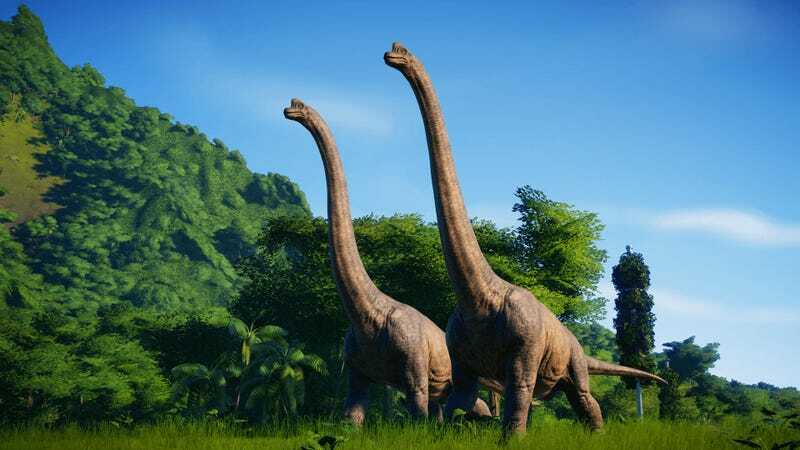 Jurassic World Evolution even includes some hybrid dinos, like the deadly Indominus Rex. Good luck trying to keep that thing contained. One night a plane is flying over Isla Sorna, the island seen in Jurassic Park III and The Lost World. For some reason the plane is carry literally a ton of dino DNA. It crashes, and the DNA is scattered across the island below. It’s up to Lori and Mark, who were on the plane, to search the dangerous island looking for all the DNA. Who owned this plane? Why was it flying over the island? Where did they get all this DNA? Stop asking questions and start collecting DNA. Lots of DNA. There are two common trends you will find in most bad Jurassic games: shooting dozens of dinosaurs and bad platformers. DNA Factor is the latter. The game looked and played awful when it was first released, and it hasn’t aged well at all. The main bulk of the game is spent sending these characters around the island where they encounter dinosaurs and the player has to help them survive. The mni games have weird controls and tons of latency. The “best” of these is one where players get to drive away from the T-Rex, recreating the famous scene from the first film. Oddly you use the shoulder buttons to steer. It’s a good idea, but poorly executed. But the final moment of the mini game, after beating it, is the best part of Jurassic Park Interactive. Yeeee-haw! When I think dinosaurs and Jurassic Park the first thing that comes to my mind isn’t Mario Party, but that’s basically Danger Zone. (Well, it’s more a terrible knock off of Mario Party, so more like Sonic Shuffle.) In Jurassic Park III: Danger Zone you and up to three other players pick characters from a selection screen that includes Rick Raptor and Farah Fossil. Players take turns moving around a virtual game board and occasionally playing bad-looking mini games. I actually played some of this back in the day and got bored soon after starting. Danger Zone includes a weird robot looking character who is actually a reference to another Jurassic Park game, Dino Defender. The same developers worked on both games, and they technically take play in the same universe. Dino Defender, like Danger Zone, isn’t very good. But unlike Danger Zone, Defender is really weird. In Dino Defender you play as the titular defender of dinos themselves, The Dino Defender. Who is the Dino Defender? They are an unidentified person wearing an advanced, possibly bio-mechanical, armored suit. InGen, the company that owns Jurassic Park, hired The Dino Defender to single-handedly track and capture all the dinos on the island and repair all of the electric systems. Which might seem like a bad idea, but this is InGen we’re talking about. This is the company who thought bringing a giant T-Rex into San Diego was a good idea. Dino Defender is platformer where you explore the island and subdue dinosaurs using gas bombs and other gadgets. The main character looks unlike anything seen in a Jurassic Park film, and when The Defender is just walking around a level without dinos on-screen it is easy to forget this is an official Jurassic Park III video game. There is a bit of a speedrunning community around the game, and watching people play this strange and terrible game super fast is oddly compelling. I love Jurassic Park and have played most of the games, but then I found out about JP Institute Tour: Dino Rescue and was left scratching my head. Until recently, I had never heard of this game. It’s a collection of mini games, another common trend in Jurassic Park games. But what makes this game so weird is that it was only released in Japan and could only be bought when visiting the Jurassic Park: Institute Tour, a massive traveling education exhibition found only in Japan that was designed to teach children about dinosaurs. If you visited the tour, you could purchase a bunch of merchandise, including Dino Rescue. The game itself isn’t that strange, or even that bad. The mini games are simple, but the art is colorful and cute. Maybe the best part is the name of the mini games, like “Rexercise,” where you help a T-Rex workout, or my favorite, “Take Meat,” where you play as a mother raptor getting meat for her baby raptors. If you really want to play this game, fans have uploaded the ROM to various websites, allowing anyone with an emulator to play Jurassic Park Institute Tour: Dino Rescue. Remember how Warpath was a not-great-but-kind-of-cool fighting game about dinosaurs? What if somebody took that concept and added an unnecessary and weird narrative to it and made the combat less fun? The end result would be Jurassic Park: Dinosaur Battles. This game is one of the weirdest Jurassic Park games ever released. A group of young children are led towards what their leader, Harrison Manly, thinks is the Cabo Blanco Nature Reserve. But their leader is an idiot, and he leads them to Isla Sorna, aka dino island. The US government somehow immediately finds out about this and sends in you, a special agent, to save the survivors. As this unnamed special agent you discover a scientist on the island named Dr. Irene Corts. In addition to cloning dinosaurs, she has also created a special tool that allows her to mentally control the prehistoric beasts. You of course get one of these new tools and use it to fight her dino guards and eventually discover the real dark secret. Dr. Corts has been cloning more than just dinos. Using DNA from the Primos, an ancient culture of humans who once lived on the island, Dr. Corts is now cloning humans to create an army of super humans. Luckily you free the cloned humans and stop Corts, who is last seen being chased by a Spinosaurus. Jurassic World Fallen Kingdom is releasing in a few weeks and maybe the Primos or the Dino Defender will return?